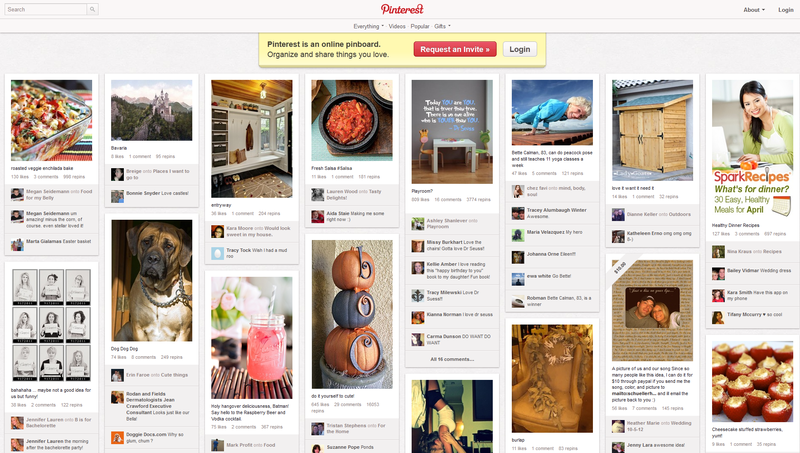 Online Retailers, Time to Get on Pinterest, a Social Network Designed for You! Any store today knows it needs to use social networks to promote its products and brands and communicate with its target clients, especially through Facebook and Twitter. Now a new social network is starting to create a buzz in the web world: Pinterest. Already the third most used social network in the world, this new American phenomenon is beginning gradually to spread to Europe, especially in Anglo-Saxon and Francophone countries. In this report, we will decipher this new phenomenon and understand how online retailers can benefit from it! Pinterest, the new social network in vogue, is all the rage in the US (it’s the third most popular network after Facebook and Twitter) with 42% of Internet users holding an active account. Of these 42%, 21% have already bought and consumed a product after seeing a picture on a “Pinterest board”(PricerGrabber Study, March 2012). Generally people purchase food, articles of clothing, decoration, and crafts with Pinterest. This social network experienced a 4,000% growth in 6 months, and now boasts about 8 million subscribers and 1.36 million users who log on every day. In a few words, Pinterest represents a pin board where you “pin” photos on your “board.” You can classify them by categories chosen beforehand. However, you’ll need to install a “pin” button on your navigation bar to easily add images seen on the web. Women represent 80% of Pinterest users. They are between 25 and 45 and are American. Currently, Pinterest’s geography is expanding and its audience is widening (for example, there are already 100,000 users in France). The average time spent per day on this platform exceeds 15 minutes (in comparison, Facebook users spend 12 minutes on average per day). Did you know that just two clicks on a photo published on Pinterest will bring you to the page for purchasing the product? Pinterest is thus a highly effective tool to increase traffic to your website. Pinterest displays and even shares your product catalog in an original way and lets you take advantage of viral marketing: Internet users who enjoy one of your products will “Re pin” you visuals on their boards. In other words, they will share their discovery of a product. In addition, you can integrate the “pin it” button into your shop to provide an interactive way of communicating your brand for free and have positive opinions about your products. As you probably can tell, we’re fans of this new social platform and its unique way to highlight our features and communicate our products. If you want to venture into Pinterest,you can register now and discover our modules compatible with your store on PrestaShop Addons.. However, you must not forget that Pinterest is still a social platform, and that its primary purpose is not to sell products.Thefancy.com on the other hand is a network operating on the same principle as Pinterest with the only difference being that all products on the boards are for sale. A social network strictly for online retailers…hmm, definitely worth a look as well!